Packed with an energizing punch of bittersweet green tea and accented with wispy notes of lavender, this is a sweet for those who are ready to take a moment for themselves. Each bar contains a full serving of Matcha! Indulge. Ingredients: Cane sugar, glucose, matcha green tea, sodium bicarbonate, lavender oil. Made in a facility that processes nuts, soy and dairy. Did I eat it? Yes. Did it feel like a chore, though? Absolutely. I'm an avid fan of all things lavender, and very much partial to floral flavours. This was just faaar too much, though. Overwhelmingly intense lavender flavour, and nothing else. I wanted to love it, I really did, but there was little to no difference between eating this brittle, and simply putting a spoonful of dried lavender in my mouth. Again, I love lavender, but a mouthful of dried flowers wouldn't be terribly pleasant. Sorry, Sweetsmith Candy Co., you might've missed the mark. I've now tried three of these flavours including this one, birthday cake, and sugar-free toffee. I really liked the toffee flavour so on my next order I decided to try the other two flavours and was disappointed in both. 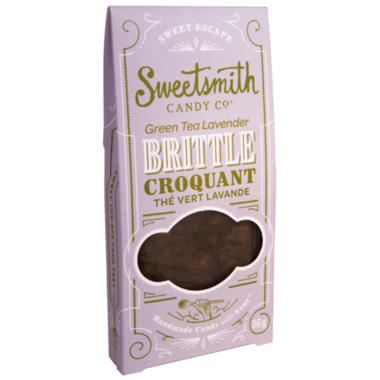 The taste of this one is far too strong in lavender AND green tea and those are two flavours I normally love!